We would like to wish everyone a great BC Day long weekend here at Koocanusa. We hope you enjoy your time here to the fullest but while in our grounds, please remember that this is a family campground and to respect our 11pm quiet time. The store is open 9am – 9pm daily this weekend and all through the summer (until the end of the Labour Day long weekend.) We carry all of your general camping supply and grocery needs as well as a full kitchen serving homemade muffins, all day breakfast sandwiches, burgers, veggie burgers, daily specials and more. We also carry 12 delicious rotating flavours of hard ice cream plus many other novelties and treats too. And of course think of us as your supply for both vehicle and boat gas here at the lake. Be sure to check out the Bayne’s Lake Farmers Market on Sat. July 30th from 9am – 12:30pm and then on Sunday, July 31st from 10am – 2pm we invite you to join us for our own Vendor Sale here at the campground on and in front of the store deck. Come check out the work of great home based businesses and arts/craft vendors who camp here at our campground. Have a great long weekend and look forward to seeing you at the lake soon! 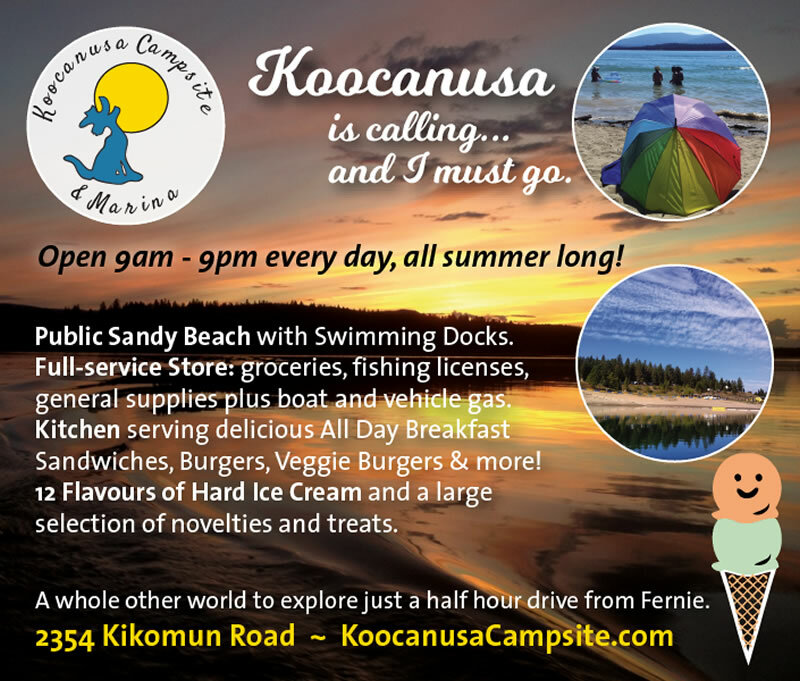 This entry was posted on July 29, 2016, in Koocanusa, Koocanusa Boat Launch, Koocanusa Campsite, Koocanusa General Store, Koocanusa Marina, Lake Koocanusa. Bookmark the permalink. ← Welcome to Summer & Happy Canada Day!